​St. John's Lutheran Preschool staff consists of a certified Early Childhood Education teacher and a full-time teacher's assistant. 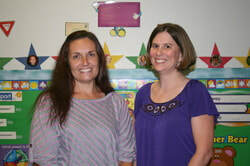 Lisa Horst (right) is Teacher and Director. Niki Thoericht (left) is a Teacher's Assistant. The three-year-old program emphasizes the social skills needed for a child to be successful in their education. One of St. John's goals is to help your child gain self-confidence and the ability to develop positive relationships with teachers and classmates. ​Maximum class size is 12 students. The four-year-old program serves as preparation for kindergarten. It provides the opportunity for your child to develop pre-reading skills necessary to be successful in future years. ​Maximum class size is 15 students. To help develop a strong and healthy self-image in each child as well as a tolerance for the differences of others. To promote the individual needs of the whole child - socially, emotionally, physically, intellectually, and spiritually. To nurture a child's skills of independence, socialization, and thinking. To assist the child in creative exploration. St. John's Lutheran Preschool is a Christian preschool that is an extension of the Christian Education Ministry of St. John's Lutheran Church of Parkville. ​St. John's Lutheran Preschool admits students of any race, color, and national or ethnic origin. St. John's Preschool began in September of 1975 to fill a need for a preschool program in our church and community. Classes were held on Tuesday and Thursday mornings with Ms. Barbara Conrad as the first teacher. The school was run as a cooperative, 12 three- and four-year-olds enrolled that first semester. Over the past 38 years, St. John's Preschool has grown to accommodate the growing needs of our church and community with both morning and afternoon sessions offered for our three- and four-year-old programs. Visitors are always welcomed on a pre-arranged basis. For additional information or to arrange a visit, please contact St. John's Lutheran Preschool at (410) 665-1234, ext. 15, or via email at preschool@stjohnsparkville.org.